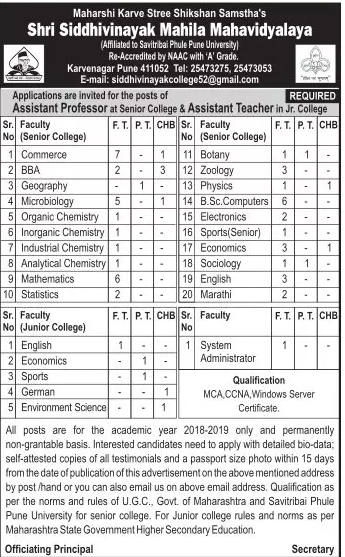 Shri Siddhivinayak Mahila Mahavidyalaya, Pune has advertised in LOKSATTA newspaper for the recruitment of Assistant Professor plus Assistant Teachers job vacancies. Interested and eligible job aspirants are requested to apply with in 15 days. Check out further more details below. About College: Maharshi Karve Stree Shikshan Samstha, established in 1896, has a century long history in the field of women’s education. Bharat Ratna Maharshi Dhondo Keshav Karve, initially founded the Samstha, dedicated his whole life to educate woman. He knew the importance of education, as that gives women power to be self-reliant.